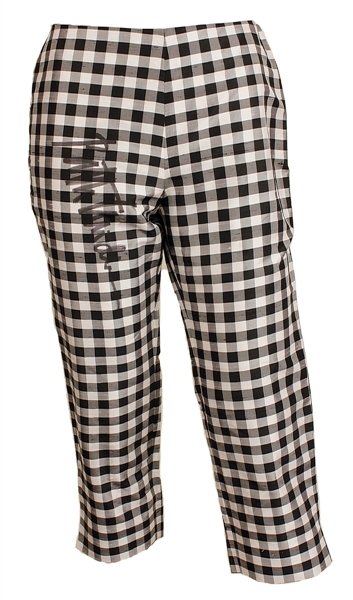 Bette Midler's worn and signed black and white silk checkered capris. Ms. Midler has boldly signed on the left leg in black sharpie pen. The capris are 100% silk and are a size 4P (petite). Very good condition. Ms. Midler donated these pants to benefit the charity Wildlife SOS. All proceeds from the sale of these pants will benefit Wildlife SOS. Comes with a Gotta Have Rock & Roll™ Certificate of Authenticity.